Builder: Pearson Designer: William H.
LOA: 39' LWL: 30'0" Beam: 11'6"
* MAIN SALON: very spacious,port setee/berth with (6) pull-down lockers above; custom varnished bulkhead-mounted book shelves behind, folding leaves teak table; S/S Newport Dickinson diesel cabin heater; Next to port is a single quarter-berth W/nav table W/ (3) drawers below. * Single setee to stbd, W/outboard storage. Interior is bright and airy, finished in a Herreshoff-style painted white bulkheads withbeautifully varnished teak trim and drawer-fronts, varnished teak & holly sole. Galley located aft of salon, starboard side. S/S sink, H&C pressure water, manual pump, 3-burner propane stove & oven (new in 2001). Large Ice box; Excellent galley stowage w/drawers, bins, glass racks, etc. 1996 Garmin 120 GPS; Recently new Raytheon wind speed & wind direction instruments; New CD/AM/FM stereo; Signet knot meter/log; Datamarine depth sounder with new transducer; Richie binnacle-mounted compass;with additional compass at chart table; NEW IN 1999 RAYTHEON 6000 AUTOPILOT; 1994 Standard Horizon VHF. Paragon transmission with vee drive; recently rebuilt. Double lifelines w/P&S gates new 1997; S/S bow and stern rail; 33lb Bruce anchor; 25lb Danforth Hi-tensile anchor; NEW LOFRANS ELECTRIC WINDLASS W/HANDHELD REMOTE (1997) Double bow rollers; 50' bb anchor chain W/110' nylon rode; 100'1" nylon rode; New Dark Blue Dodger and S/S frame (2000); Teak swim ladder; New custom awninng with poles (2000); Manual bilge pump; 6 life jackets; flares, bell, horn, boathook; Varnished teak staff W/ensign; 4 fenders; 4 dock lines; one fender board; Two dorade ventilators; Teak screens for hatches and screens for opening ports; Mastead lights and foredeck light. Winch handles; Teak cockpit table; Searchlight; 4 Square cockpit seat cushions; Lead line; Various spares for engine and electrics. Original engine manuals (two copies). New propane bottle W/pressure gauge. Large self-bailing aft cockpit with elk hide covered Edson pedistal wheel-steering; Teak cockpit grate; Ablative bottom paint (4 coats) applied recently and maintained annualy; S/S shaft, bronze 2-bladed prop. (spare folding prop); Full engine instrumentation including engine hour meter, ampmeter, oil pressure, water temp & rpm. 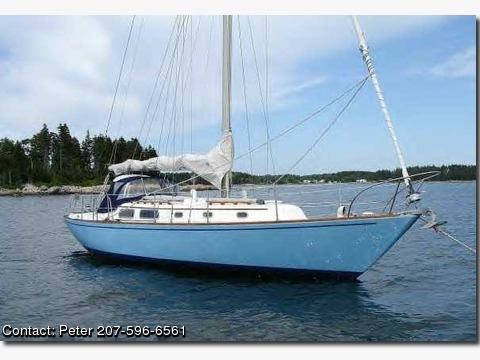 * Masthead sloop rig, mast sepped on keel; aluminum mast and boom; Harken roller furling jib system; Jiffy reefing on Main; 1993 North Main with 3 new sets of reef points; 1992 Bohndel Main with 3 reef points (spare); 135% Genoa with high clew, good condition; 150% Genoa with foam luff by Anson, new in 1997; MPS multi-colored sail by Anson with turtle new in 1996; White anson sail cover new in 1997; New 2002 1 X 19 S.S standing rigging; Dacron running rigging, renewed within 10 years; (2) Lewmar #46 ST mains; (3) halyard winches; Lewmar mainsheet traveler aft of cackpit; Spinnaker pole. Her rig promotes single handing with ease; Meander has been lovingly cared for, and maintained by a very knowledgable yachtsman. Her beautiful medium-blue W/navy blue boot top and cove stripe, newly awlgripped in 1998, annually buffed hull gives her an appearance of a very new boat. Her top sides are gorgeous, with new standing rigging, and no-nonsense "sharp" appearance is a delight to behold. Her varnished teak exterior trim brings her overall impression to a peak, demanding appreciation for her stature. She's no "Little Harbor" or "Hinkley", and certainly not an "Oyster", but she will turn heads none-the-less, but all of them will have to read her name over their bow given equal size! * Meander's asking price is slightly more than others like her. But given the fact that all the necessary upgrades that bring her up to speed for the times has already been accomplished. * Her owner didn't expect he'd have to sell her when he invested in making her like new. Don't pass this one up without close inspection first.